By the Western Han period, iron had become the material of choice for agricultural tools and weapons, and the number of bronze objects in tombs decreases dramatically. Those objects that were made of bronze were primarily coins and mirrors rather than vessels. 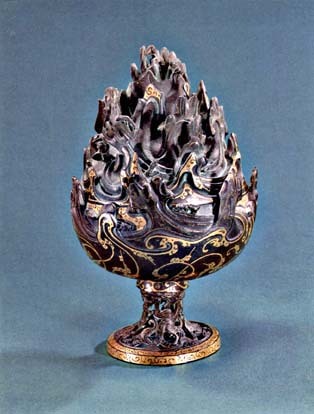 The bronze vessel as an art form also declined with the rise of representational art in the Han period. For the first time images of daily life began to appear in tombs in the form of wall reliefs and earthenware models. Before this time, representations of scenes from life had been rare, a minor artistic concern when compared to the interest in shapes and surface decoration. In the tombs at Mancheng, however, the bronzes are mostly unadorned vessels meant for everyday use. The six objects below are exceptions. 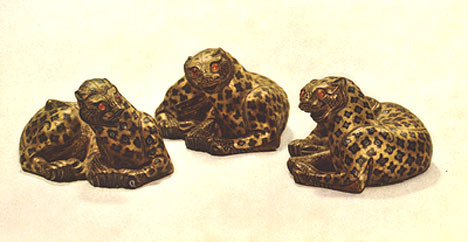 To the left are three bronze leopards inlaid with gold and silver plum-blossom designs. How are these animals given an air of animation? 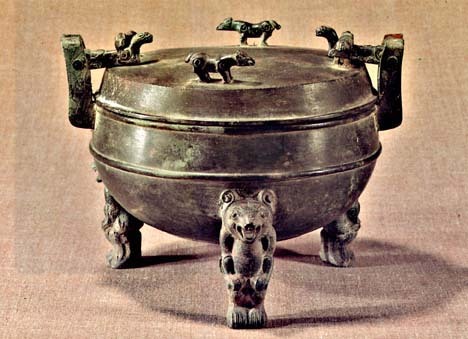 The two ears of the bronze ding to the right are fitted with movable animal-shaped pegs to keep the cover tight. How does this ding compare with others you've seen? The three feet are in the shape of what animal? 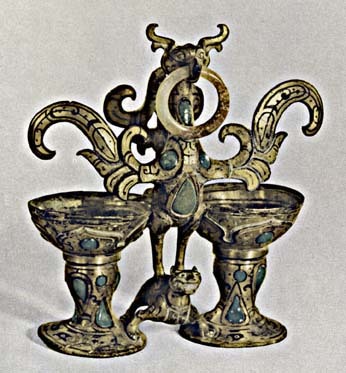 The bird-like creature in the center of this double cup holds a jade ring in its mouth and its feet are planted on another animal. 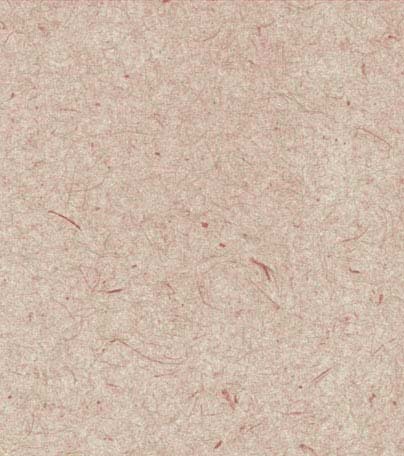 It has been cast as a single piece. To the right is an incense burner inlaid with gold. Three dragons emerge from the openwork foot to support the bowl of the burner. The bowl is decorated with a pattern of swirling gold inlay suggestive of waves. 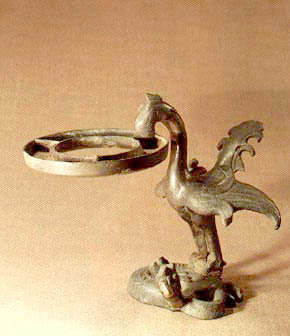 The lid of the burner is formed of flame-shaped peaks, among which are trees, animals, and immortals. There are many tiny holes in the peaks. What religious significance might this incense burner have? Is there any connection between the beliefs evident in its design and the rest of the tomb? Can you imagine the effect when incense is lit? 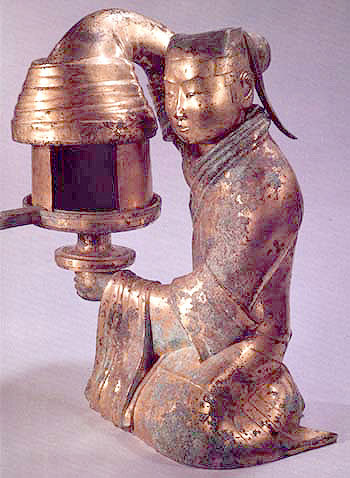 Oil-burning lamps were a common means of night-time illumination in this and later periods. The lamp to the left has an ingenious movable door to regulate the supply of oxygen and thus the strength of the fire. Smoke from the fire would go up the sleeve, keeping the room from getting too smoky. How do you think this lamp would look when oil was burning in it?